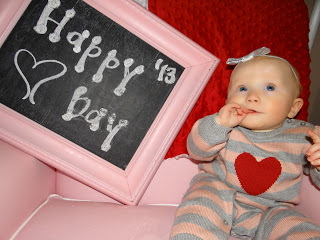 Just like every other holiday since welcoming our daughter, Valentine’s Day was way more special now that we have a child. Let’s be honest. Every day has new meaning since we had Waverly Maye. I (of course) still celebrated the day with the same Valentine that I have had for many years now. But neither of us were complaining to add our third addition to our romantic day. 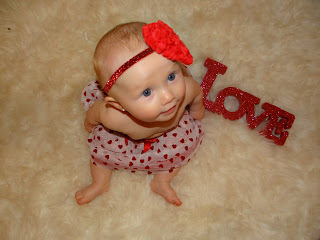 In fact, she was (like all other recent days) the “leading lady” of our Valentine’s celebration. I hated working & being away from my two Valentines during the day, but felt lucky that she was able to spend the morning/early afternoon with my mom. And they spent their time in festive fashion by creating a Valentines-themed stuffed animal at Build-A-Bear. I (like all other recent days) rushed home from work full of extreme anxiety to see my baby girl. 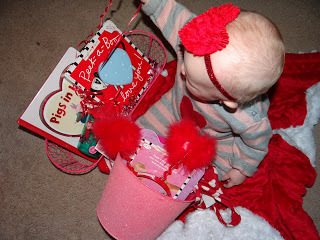 My heart was full of love (again, like all other recent days) and I couldn’t wait for her to open her basket of V-Day goodies. After some snuggling & cuddling (as much as she will let me these days) we reunited with the third member of our trio for an ice cream date. Frozen yogurt AND my two favorites? Not sure I can think of anything better in life. 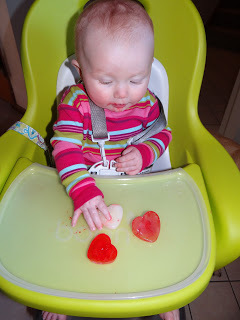 Ice Cube Hearts Made in a cupcake heart tray. 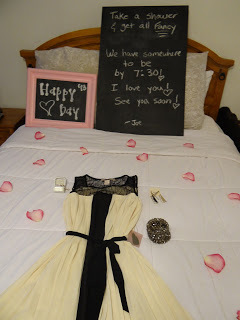 Cute idea? Yes. Total mom fail? 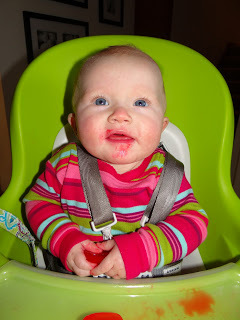 Putting food coloring in them … see below. He would have made my entire weekend with the clean house alone, so the fact that he bought me a dress (that I even liked!) and had planned for my parents to come and watch Waverly was just the sweetest move ever. 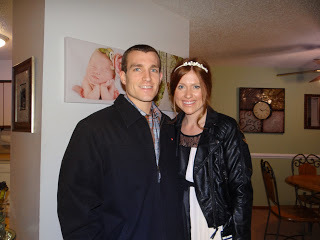 Even though I was sad to leave my baby girl, a romantic, grown-up dinner with my hubby was perfection. Valentines Day 2013? Memorable, sweet, and lovely. Can’t wait to see what 2014 brings. 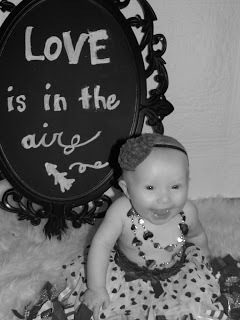 Waverly Maye’s first Valentines Day was a success. I truly can’t think of a better Valentine or a more perfect way to spend a holiday than with my girl. And that is just what I did. Of course, I realize that she won’t remember the details, so I’ll post them soon. (I have every intention of her reading each post from this blog one day, and hope that dream comes true.) 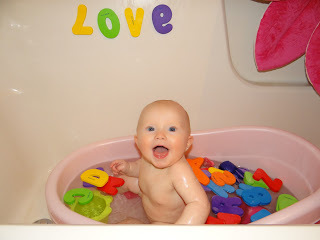 But in the meantime, I can’t resist just one photo of my little silly sweetheart. OK, two. I mean three. Waverly’s outfit is from Baby Gap. 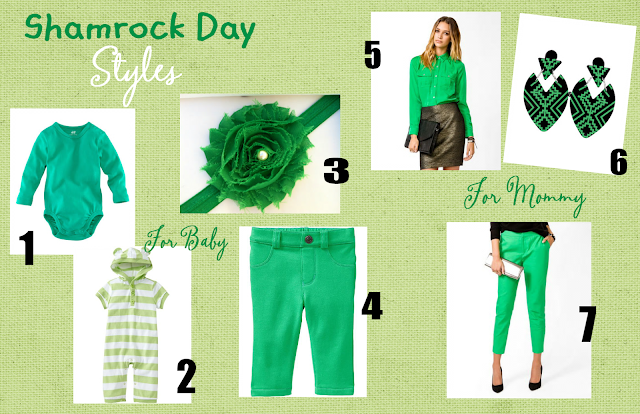 ﻿﻿ So it’s pretty fair to say that me & my mini-me will definitely be dressing in the color of the month. And most likely doing a few festive activities, too. Obviously. 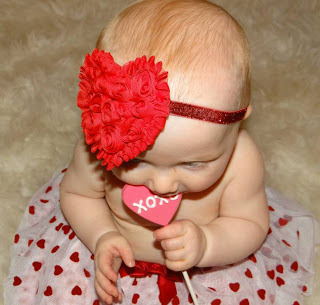 I am fully aware that I have could have titled more than one recent post with “Our Valentines Photos.” I blame a combination of my obsession with my daughter, pictures, holidays & fashion with the fact that I have been including Waverly’s Looks of Love for a couple of weeks now. However, these pictures are the official ones. The ones that I really planned for (not that I didn’t plan the others). The ones that I shopped for, bought a few props for, and had my mom come & help me with. And the ones that I used for our 2013 Valentines Day card. Although they are certainly not as professional-looking as if I had paid a photographer, I am pleased with the results. Not that I have ever been less than pleased with a picture of my baby girl. Like I said, I am obsessed with her. 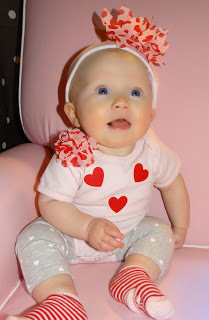 With Valentine’s Day only two days away, ﻿My Stylish Sweetheart has continued rocking some sweet ensembles. 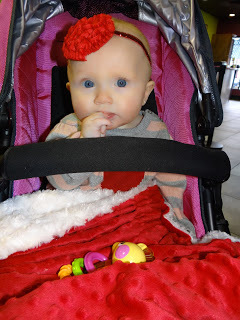 Even though I think it’s totally ok to wear hearts any day of the year, I have found it completely necassary to adorn her in (an overabundance of) pink, red, and hearts since February 1st. My Heart Belongs to Daddy. 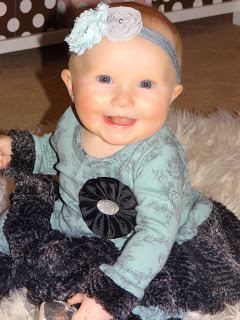 Waverly’s onsie is from Zulily, leggings from Carters, and BOW from Itty Bitty Bows. 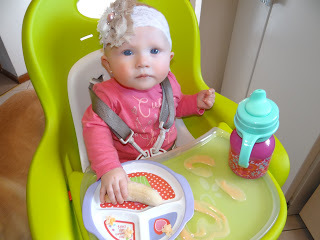 PS – Can you believe I actually fit a bow in those little locks? 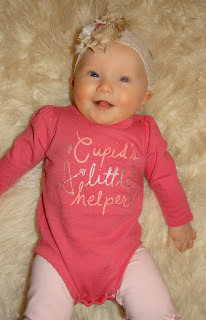 Waverly’s onsie is from the Gap Outlet, leggings are from H&M, and headband is from Etsy. 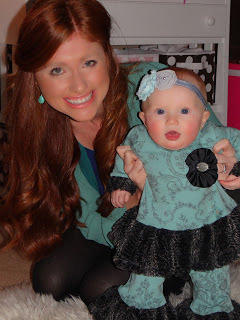 Waverly’s onsie & hat are from Zulily, leggings & socks are from Old Navy. A heart on that booty? Not much cuter. 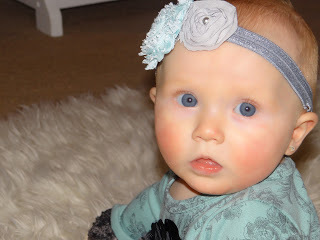 Wavery’s entire outfit is from Zulily, and headband is from Little Hip Squeaks. YAY for two days until a reason to celebrate. A holiday just for Hallmark? I think not. Disclaimer: I realize that a Half-Birthday party is ridiculous, over the top, and completely unnecassary. But I must also say that in my defense, a celebration really isn’t ever a bad thing. Festive decorations, a matching outfit, and a get-together with loved ones? Sounds good to me. I will take advantage every time. 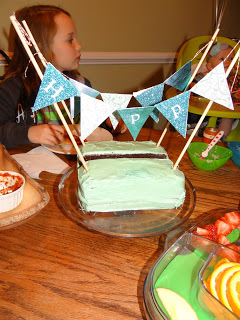 I admit it, I initially heard of the idea for a half-birthday party on Pinterest (where most of my ideas are born.) 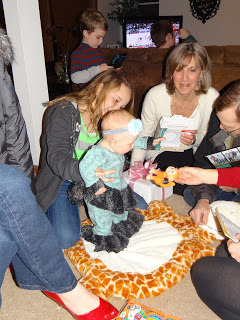 It seemed like the perfect chance to get our families together while marking a milestone for our baby girl. 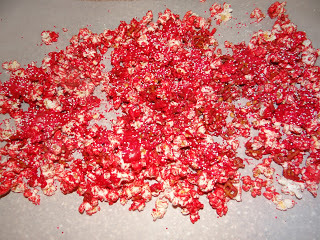 Of course, I had to promise my husband that I wouldn’t go over the top. 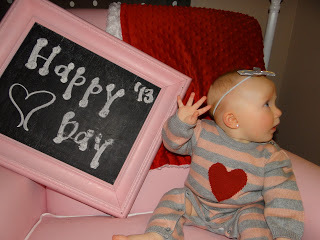 In other words, I had to resist my temptation for invitations complete with Waverly’s 6-month chalkboard photo. It was hard, but I did it. I had to settle for a (half) birthday cake with a cake-bunting on top. And 3 (teal-colored) balloons. Waverly Maye’s Half-Birthday ensemble. The entire outfit is GIGGLEMOON. Had to include one close-up. That face. To make the cake bunting …. I cut the triangles out of scrapbook paper from Micheals, folded them over, then hot-glued them to the string and attached them to the dowels (also from Micheals.) The letters were cut on my Cricut machine, and later hot-glued to the paper. 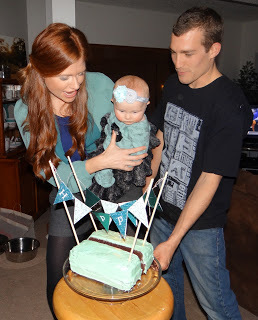 YES … we did sing Happy Birthday to our 6-month old. I considered it practice for the real thing come this July. With my girl. It’s true. I dressed in the theme colors of the evening. Just couldn’t resist.